Agnes Magero is the Head of the Safaricom department responsible for tackling money laundering. 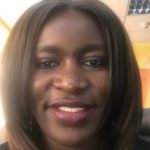 She has worked for Safaricom since 2006, occupying a series of roles relating to compliance, controls, risk management, accounting and mobile money. Agnes is a highly-qualified individual. She is an MBA, Certified Public Accountant, Bachelor of Commerce and Certified Information Systems Auditor.